Islamic State have ramped up their public hatred of LGBT people displaying a number of horrific and barbaric murders of innocent gay men on social media. In the most recent posting, a young gay man was shown being blindfolded and then thrown off a multi-storey building in the Syrian city of Raqqa to the cheers of a large crowd of IS supporters below. The chilling photographs show the crowd clambering on to rooftops to get a better view of the savage scene and graphically show the fear on the young man’s face as he falls to his death. The brutal murder follows a similar incident in December also posted online where IS extremists threw a 50 year old man from a seven storey building. Video footage shows that the man survived the sickening fall and was then stoned to death by the bloodthirsty crowd of onlookers. Sadly, these are not isolated incidents. The Islamist group violently enforces a radical interpretation of Sharia law. Images of men being thrown off buildings and then stoned in several Syrian cities have been published online with horrifying regularity. 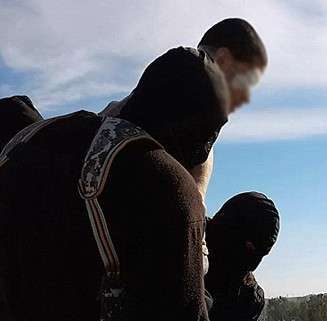 Reports of numerous other gay men been thrown from buildings in Syria and Nothern Iraq have been leaked to international media, as have reports of gay men being beheaded, burned, and stoned to death along with reports of gay men being crucified and left to slowly die. The images of the latest incident were released by a local activist group in under a title Raqqa is Being Slaughtered Silently. The group, reportedly, works undercover in the IS stronghold to expose the terror group’s atrocities. The photographs carry the distinctive yellow logo of IS’ propaganda wing Al Hayat Media Centre, suggesting they come from an unreleased video of the savage murder.